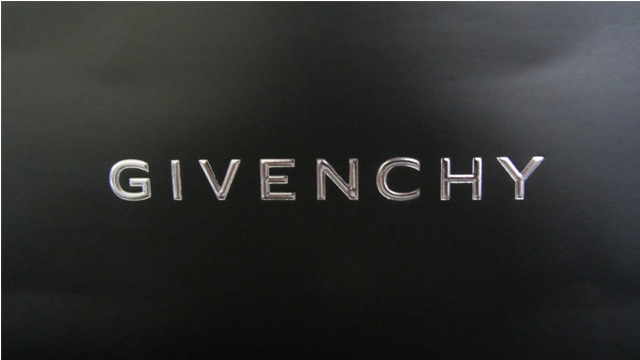 I was lucky enough to get hold of one of the British Beauty Blogger Givenchy beauty boxes. 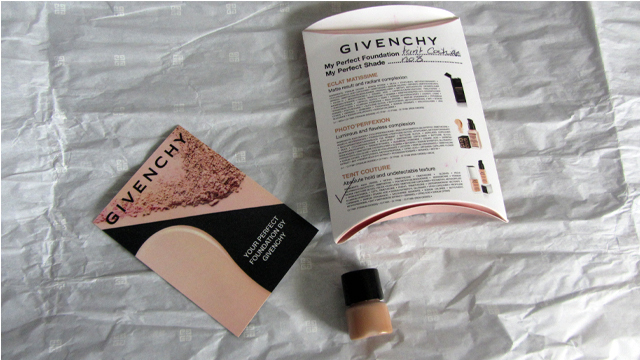 Inside was an empty bottle which I could take to a Givenchy beauty counter to collect a five-day sample of foundation. 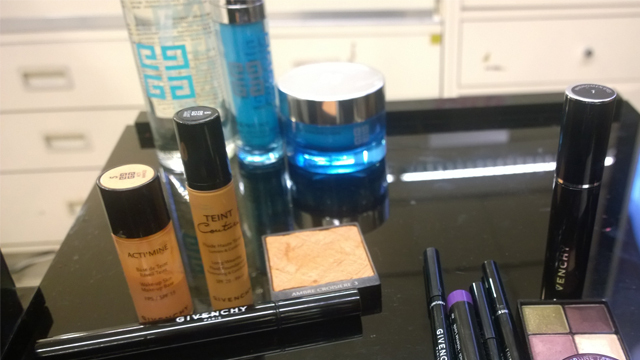 There was also encouragement to try one of the Givenchy makeovers so I booked a full make-up lesson at House of Fraser in London Victoria. I was warmly welcomed by Faith the consultant and Shadia the Givenchy makeup artist, with a glass of bubbly and a mini cake. I’ll try to remember the products used – I wanted to enjoy the pampering so I wasn’t sure whether I wanted to write a blog post about it until now. We began with a discussion on my skin type and what look I wanted to go for. I have dry and oily skin and I love bright colours so I asked for a bold look. Shadia prepared my skin by cleansing it with Skin Drink, applying Flash Luminescence Serum and finishing with Hydra Velvet Moisturising Cream. Shadia evened out my skin tone using Acti’Mine Makeup Base SPF 15 in shade 5. I decided I wanted a natural looking foundation so Shadia used Teint Couture in shade 8. She didn’t use any powder as this would have taken away the glowing skin effect. She then mixed the foundation with the Mister Light Corrective Pen in shade 5 and applied this to the upper part of my cheekbones, under my eyes and up to my temples to highlight. She then added depth using Poudre Bonne Mine in Ambre Croisiere (shade 3) in the hollows of my cheeks and around the top of my forehead where the shadows naturally fall. She finished my complexion with Le Prisime Blush in Vintage Pink, a very pretty combination of four soft pinks. Shadia prepared my eyelids using Ombre Couture in Prune Taffetas as a base then finished the eyeshadow using Prisime Quatour Eyeshadow in Tentation, a palette of purples and a green which is one of my favourite combinations. She lined my upper lid with Givenchy Liner Couture, a felt-tip style eyeliner and flicked it out. 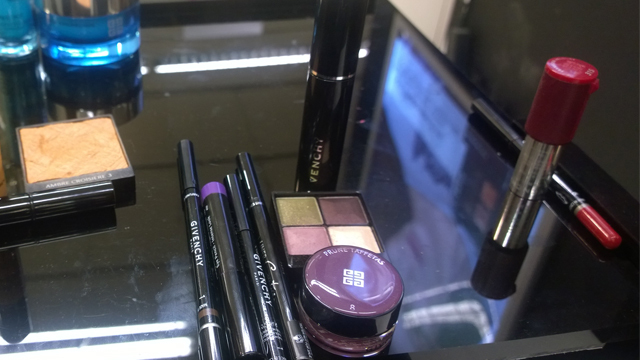 Shadia lined my waterline with black eyeliner and lined the lower lash line with a limited edition Colour Kajal in N3 Purple. She finished my eyes with Phenomen’Eyes mascara in Deep Black and defined my eyebrows using Eye Brow Show Pencil (although I’m not sure which shade she used). My lips were dry so Shadia prepared them using Hydra Sparkling Magic Lip & Cheek Balm Moisturizing Rosy Glow. I think “magic” is an appropriate name for this balm – it was very soothing and hydrating which was expected. What I didn’t expect was the gorgeous pink shade it turned my lips which did not resemble what I saw in the pot! I would wear the balm on its own without any need to add colour on top. Shadia then applied a deep pink creamy lipstick and finished by defining my lips with lip pencil. Sorry but I don’t know the shades of either product. Unfortunately I don’t have any blog-worthy photos of my face to post. I forgot to bring my camera, the lighting was bad so my phone photos are not great then on the way home I got caught in the heaviest rain I can ever remember encountering. By the time I got home, I was soaked through with mascara in my eyes and running down my face! I was very happy with the service and impressed with the products. As you may know from other blog posts, service is everything – even if I love a product, if the service is bad I’ll probably walk away, most likely in the direction of another beauty counter. I bought a couple of items and received some more samples. I’ll post about the two items I bought separately but for now, why not guess which products I chose?